I love finding pictures of my grandparents when they were young and in love. So sweet! It’s often surprising in my research when I find that my ancestors had more children than I thought they did. One example is my great-great grandparents Fred and Mina Moore. They were married in September 1885 in Plymouth, Michigan. They had a child I didn’t know about named Hazel, who was born January 5, 1888 and died August 1, 1888 of cholera. She is listed as male in her death registration, but female in her birth registration. One discovery I made on my visit about 15 years ago to the Allen County (Ind.) Public Library was the book “Follow the periwinkle: cemetery records of Henry County, Virginia” from the Henry County Historical Society. Robert Luke Wells, my great-grandfather, died in 1919 of typhoid fever. From “Follow the periwinkle” I discovered he was buried in Pleasant Grove Christian Church Cemetery. From there I was able to find his tombstone (although his dates of birth and death are slightly wrong). One ancestor I’d like to meet is my great-great-great grandmother Margaret Rhost Gisel. She was born June 6, 1848 in Switzerland (or it may have been Germany at the time). Her father was Conrad Rhost and she had one full brother, named John. I have no idea who her mother was, but I believe she either died in Switzerland, on the way over, or soon after arrival because Conrad remarried to Mary Gertrude Ginder on October 9, 1855 in Fulton County, Ohio. Conrad and Mary had 8 more children. I first found Margaret in the U.S. in the 1860 census. Conrad, Mary, John, Margaret, Mary, and Henry were living in Clinton, Fulton County, Ohio. Conrad was a farmer. John and Margaret were listed as 14 and 10 and attended school. Mary was 3 and Henry was 1. Margaret married John Gisel in 1868. They had 9 children. Margaret and John lived in Fulton County, Ohio all their married lives. John died November 1, 1923 and Margaret lived to the age of 90. She died April 20, 1939 (11 days after her great-great grandson, my dad, was born). They were buried in Wauseon Union Cemetery. 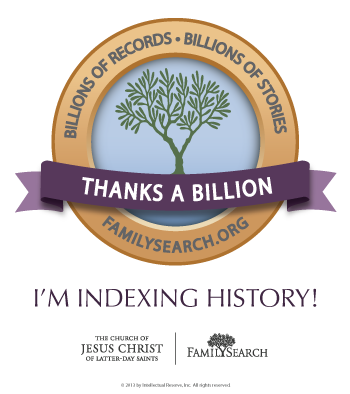 I don’t have a ton of unusual names in my family tree – the ones that are unusual are usually biblical. My great-great-great grandfather Adam Bost had four brothers: Azariah, Abraham, Michael, and Samuel. Azariah Bost was born in about 1830, the first son of Samuel Bost and Sarah Kinder. Azariah and Hannah Long were married in April 1857 in Henry County, Ohio. Their son Joseph was born in July 1858. In 1860, the little family was living in Harrison, Henry County, Ohio. Azariah was 30, Hannah was 19, and Joseph was 2. Azariah enlisted in Company A, Ohio 68th Infantry Regiment in October 1861. on 17 Oct 1861. Azariah died of disease on March 22, 1862 and is buried in the Shiloh National Cemetery. 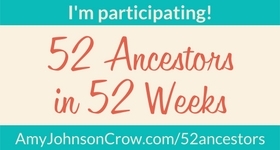 The ancestor that was one of the biggest challenges for me was someone who lived relatively recently and is pretty closely related to me (great-grandfather). William E. Oakes was the first husband of Mae Moore and the father of Helen Dorothy Oakes, my grandmother. Reasons he was a challenge was that Helen was born in 1912 and her parents divorced in 1915. I’m not sure if she ever saw her father again. She never talked about him. Also, he died when he was only 40, in 1928, when my grandmother was only 16. The document that helped me the most and started unraveling the mystery of William Oakes was his and Mae’s marriage registration. Through that, I discovered their marriage date (Dec. 23, 1908), his age (21 and therefore an estimated birth year of 1887), and his parents names (Henry Oakes and Minnie Schroeder). This helped me to find the Henry Oakes family in the 1900 census in Nankin Township, Wayne, Michigan. William was listed as “Willie Oak” with a birthdate of July 1888. In the 1910 census, though they were still married, William and Mae were not living with each other. She was a boarder with her mother and worked at a theatre as a ticket clerk. I haven’t found William in 1910 yet. Their daughter Helen was born June 19, 1912. William and Mae were divorced July 13, 1915. William married again on January 1, 1916 to Pearl Sullivan. Another interesting document that tells a lot about William is his WWI Draft Registration from June 5, 1917. He and Pearl lived at 317 W. Kirby in Detroit, which would have been near the corner of W. Kirby and 3rd Avenue. His birthdate was listed as July 8, 1888. He was a foreman for Ford Motor Company. He claimed exemption from the draft due to poor health. “Detroit’s municipally-operated hospital located at St. Antoine and Macomb streets…and was opened October 12, 1915. “It was established by the Poor Commission, now known as the Department of Public Wefare. According to William’s death certificate, he died of “Acute nephritis superimposed upon a chronic nephritis” with a contributory cause of chronic myocarditis. He was buried in Northview Cemetery in Dearborn. This week I wanted to talk about the first-born child of my great-great grandmother Martha Gisel Belknap. Her name was Minnie Gisel. She was born March 31, 1887 when Martha was just 17 years old. On Minnie’s first marriage license her father is listed as “not known” and her surname is her mother’s. I’m afraid to know what this could mean. I hope Martha just had a teenage dalliance when she was 16 and maybe Minnie didn’t know his name when she went to fill out her marriage license. Minnie was adopted, formally or informally, by my great-great grandfather Arthur Belknap when he and Martha married on March 5, 1890. Minnie married Ernest J. Crume on May 23, 1903 in Fulton County, Ohio when she was 16. Their son Glen was born August 31, 1903. Their daughter Irma was born June 22, 1905. In 1910, the family was living in Lima, Ohio where Ernest was a carpenter. In 1912 and 1913, Ernest was a pattern maker rooming at 132 11th Street in Toledo, Ohio. In the 1913 Toledo Directory, Minnie was listed as a waiter. In 1916-1918, they were living at 119 12th St. in Toledo. In 1919, they were living at 2034 Vermont in Toledo. On May 22, 1919, their son Glen died at the age of 15 in Fulton County. He was buried in Wauseon Union Cemetery. In the 1920 census, the family was living on Cemetery Street in Fayette Village, Gorham Township, Fulton County. Ernest J. Crume, 39, of 1416 Pinewood in Toledo, Lucas Co., Ohio, died at home from Nephritis and Erysipelas. He was employed at Overland Auto, and worked as a Pattern Maker for automobiles. He is the son of Henry and Elizabeth (Walters) Crume. Mr Crume is survived by his wife Minnie, who was the one who reported his death. On April 28, 1923 in Henry County, Ohio, Minnie married again. Her new husband was named Lee Counselman. He had three previous wives and would have one more after Minnie’s death. Sadly, Minnie died at the age of 37 on February 24, 1925 in Gorham, Ohio of peritonitis. She is buried in Wauseon Union Cemetery.